A brief foray into the up-to-date is not that enjoyable, to be frank. Several worries on my mind, and Zerlina has a dread skin disease. Impetigo. Yes, I know. I too thought it had vanished years ago, sometime when there was one pair of children's boots in the family and the youngsters had to take it in turn to go to school. But z developed a painful blister which turned into a scab that was agonising to touch (at this point she kissed me, cried bitterly as a painful result and I'm now waiting to see if I caught anything) and now she's on disgusting-tasting antibiotics for a week which will wipe out her immune system, just in time for her to start school. Nice. But Weeza and Phil, Z and the Sage are pulling together as always and it'll work out. We all have additional concerns of our own and honestly I'm best talking about the past for now. It'll get better, it usually does. Weeza was working today and couldn't leave z with the childminder as she's contagious, so I slept at their house overnight and brought z home with me. I stopped on the way to stock up on sweets, chocolate and that awfully healthy yoghurt drink that's supposed to restock *good* bacteria. Even the nurse suggested sweet treats to take away the flavour of the medicine. Did I mention that it's administered 4 times daily? The sound of z's bitter cry as I made her drink it still rings in my ears, and poor Weeza and Phil have to do it for most of next week. Still, we did have some fun too. I threw a tennis ball and she turns out to have a pretty good eye and quite often returned it - okay, that was sometimes because I hit the racquet, but she also swung it and hit well. We picked runner beans and sweet peas for Weeza, we made cakes and we watched cBeebies, because television is sometimes the best thing when you're played out. Tonight, I mostly drank gin. Tomorrow, back to the past. The best thing was the anticipation. I especially loved decorating the tree. We had six little painted glass birds, each with a clip attached to its feet to hold it to the tree. I thought all of those had been lost or broken. I remember once we planted out the tree - though it died, it was too big to survive being dug up, indoors for a fortnight and replanted, and when we went to dig it up again we found one of the bird decorations still on it, with the colours bleached away by sun and wind. There were little glass bells with clappers and I always made sure one of them was near the stairs so that I could touch it as I ran past. I didn't always run upstairs, only if I didn't have a book in my hand. If I was reading, I walked slowly. When I came down, I usually jumped. I've already said that there were 18 stairs and two half landings. The first flight was six and I had to be feeling quite brave to jump them. It wasn't the six down, it was the length out. I never did dare jump the seven, I knew I'd catch the last stair and have a nasty landing. I always jumped the final five into the hall. My sister reminded me recently that our mother called me "Baby Elephant" because of the noise it made, although no one ever told me to stop. I always loved the old glass baubles, although a few got broken every year. There were also a few pine cones painted gold that my parents had decorated in the first year of their marriage when so much was still rationed and more unobtainable. They bought a crib set from Woolworths and this was always set out too. I'd not seen any of these for years and I assumed that they were gone, but when sorting out the last odds and ends of my mother's stuff that had been put in a back room here, earlier this year, I found a box where she had carefully put them away. There was still one of the birds complete with its nylon tail and a second without. In those days, I don't think there were many parties before Christmas Eve. There was the Yacht Club children's party - I found up a photo of me and two friends recently in an old edition of, I think, East Anglian Life magazine. If I can remember where I put it, I'll scan it in and show you some time. I'll also take a photo of the decorations. But mostly, celebrations were held after Christmas - after all, the holiday period is actually from Christmas until Twelfth Night, although now this has gone by the board and many people take down their decorations before the new year. I can't quite remember what my parents did, but I can work it out, I think. There can't have been anything before the day, because my mother decorated and laid the table several days early and we ate off a small table set up in the study. I expect they had a party a few days afterwards and served turkey and ham pie to use up the wretched bird, it wouldn't have been wasted and she was a good enough cook to make it delicious. And of course there was the famous biannual trifle, which I've already mentioned. She had a Victorian glass jug and basin, not a good one at all, very thick and plain, but the basin was very useful when feeding a lot of people, for fruit salad or trifle, and I remember the Christmas trifle being made in it, so it must have fed at least 20 people. And then there was the Stilton and other cheese and celery, it wouldn't have been a complicated meal at all. Just a relaxing, chatty get-together with friends. And that's what I enjoy about parties. Good straightforward food so that the cook isn't worn out and stressed. A relaxed atmosphere, where you can chat with friends and be welcoming to incomers. I dearly love to be spontaneous, and there's nothing I love better than to gather people up and bring them home for pot luck, though that doesn't happen very often. But as with this blog, where the interest lies less in what I say than in how you respond to it, both to me and to each other, a party is all about the guests. If they come to have fun, no one cares if the food has gone a bit wrong, none of the plates match or you bring a bottle or pudding because the host can't afford money or time. If anything, it adds to the jollity. I think I'm partied out for the moment - that is, writing about them. Something else next time. My father and his lifelong friend, Ford, shared a similar sense of humour. At one time, my father subscribed to a DIY magazine - not serious stuff around the home but carpentry projects for amusement rather than use. I'm pretty sure it was an American magazine, but have no idea of its name. Actually, Daddy was quite keen on woodwork and made various things at one time. For example, he made several large wooden planters to go along the terrace. But for the Christmas issue one year there was a Santa Claus scene, complete with Father Christmas, sleigh and presents, reindeer etc, all cut out of plywood. So Daddy made it. Must have taken weeks. And on Christmas Eve, one of our friends always held a big party to which *everyone* was invited, so he waited along the road until he saw Ford and Bunty's car leave and drove down, with Mr Weavers the gardener, and they spent the next hour or so erecting the scene on their roof. Father Christmas himself was halfway down the chimney. Then of course he and my mother went on to the party, fashionably late. The next year, Ford turned up after my parents had gone to the party and spent quite some time planting plastic daffodils in the shrubbery. A petrol station had given them away and they'd had all their friends saving them up. The Christmas preparations seemed more important than the day when I was a child. Keenly looked forward to, it was always a bit of a disappointment. The decoration of the table was a big thing. My mother used a big white tablecloth and red and green satin - one colour was laid in strips along and across the table and the other was made into big bows and pinned at each person's place. We had a huge tree in the hall which almost reached up to the top of the bannisters above and vast amounts of food and drink were bought. Tell me, did anyone ever eat those packs of dried figs and dates? And it was the only time of year you ever saw those little lemon and orange half-slice sweets. Everyone bought them in, it was part of the ritual, and they hung about for weeks. The turkey was massive. It took hours to cook. So did the whole ham, which was boiled, taken out and skinned, sprinkled lavishly with demerara sugar, the fat slashed into diamonds and alternate diamonds decorated with a clove. Then it was put in the oven to caramelise the sugar. It was the best part of the meal, none of us was all that fond of turkey and after my father died we never bothered with it. With a great deal of preparation to do, the first course was always tinned consommé with sherry added. Then the turkey and ham, roast potatoes, sausages wrapped in bacon, several different vegetables - no bread sauce, we never had that. We had mustard and redcurrant jelly though. There was so much food, it bewilders me. None of us was fat and I had a tiny appetite as a child. The appearance of the pudding, boiled for hours, doused in brandy - a sugar lump on top soaked up brandy which meant that once it had been lit the flames lasted well - and brought to the table ablaze. Unfortunately, we then had to eat the wretched thing. None of us liked it much, it managed to be both rich and dry. So was the elaborately decorated Christmas cake. Both were made by our ex-chef, Mr Dyke in Weymouth and my father picked them up on his pre-Christmas run to fetch my grandfather for a holiday and distribute presents to friends. We used to valiantly eat about a quarter of the cake and pudding and spend the rest of the winter breaking them up for the birds. There was also a whole Stilton of course, which was wrapped in a large white napkin and put on the Stilton cheeseboard, which was large and round with a cover, and attacked with a cheese scoop. That was the other best part of the Christmas food, every bit of it got eaten in time. The rest of the ham was eaten for breakfast every day between Christmas and New Year. We were allowed to open our stockings of course, Wink and me, but no other presents could be opened until Mummy was ready. In theory, this was noon. It never was, of course, and we waited for hours. Eventually, there was the big ritual of the present opening. Wink and I didn't have much family, my mother was an only child whose father's brothers had been killed in the Great War and, although her mother was one of ten, she died at the age of 25 and they lost touch with everyone in the family in the course of the Second World War, having just moved from North Wiltshire to Dorset a year before it started. But we were given a lot of presents by our parents' friends and every one had to be written down, of course, so that we could write and thank them. Father Christmas always gave a packet of notelets for this purpose. The standard regular get-together was, of course, the drinks party, which happened regularly. A number of my parents' friends never held dinner parties, though they might invite us round for Sunday lunch, but of course hospitality was returned in one way or another. We all belonged to the Yacht Club in Lowestoft so often met there - I seem to be including me in this, but of course it depends on what was happening and how old I was at the time. As we got older, Wink and I certainly joined our parents at Sunday drinks dos, and when they invited people round we'd have helped out, offering plates of food and so on. Canapés would have been quite simple in the early days, eg caviare on Ritz crackers, bits of smoked salmon on brown bread, morsels of cheese and so on, and there would have been olives, nuts, crisps, all the usual. It was fine just to have the latter, there was no need to do more as it was a pre-lunch or dinner affair and only lasted an hour or so. Interestingly - well, to me anyway - although neither of my parents smoked, they always provided dishes of cigarettes for their guests back in the early '60s. That's a real mark of changing times. I don't know when that stopped, but ashtrays were still put around for years. Now of course, few people would smoke inside their hosts' house but go outside for a smoking break, even if invited to stay. The other thing that strikes me is how much people drank in those days - although I suspect that alcohol wasn't a part of everyone's everyday life and just kept for the weekends. As I said in an earlier post, wine was always on the table at dinner time in our house, but that wasn't the norm with everyone. But at drinks parties it wasn't just wine on offer but a full range of spirits and mixers. As a child, I remember drinking Bitter Lemon at our friends, Frank and Jean Barnitt's house, which I liked very much as we never had it at home and it seemed sophisticated. Once I was in my teens I was given sherry and I seem to remember knocking back a fair bit - easily a couple of glasses, enough to make me feel warm and woozy. From my teens, I was allowed wine at home too, but I rarely drank it as it was a bit dry for me, it took some time to build up the palate for it. An abiding memory for me, and one that I'm sure I've mentioned before, is a Sunday morning drinks party when my parents served champagne. One of the guests had Parkinson's Disease. She was the mother of a friend, whose husband later became our family doctor (it was he who delivered Al) and lived with them. She was probably in her early sixties then, and already quite shaky and incapable of holding a glass steadily. She was always happy, chatty and laughing however, with an indomitable spirit. I have an abiding memory, half a century on, of her sitting on the settee, one person holding the champagne glass, another holding the straw to her lips, another keeping her head steady as she sipped, and of her laughing at the ridiculousness of it, so much that she could hardly drink. As an example of sheer gumption and determination to retain a love of life, whatever adversity hit you, it made a huge impression on me. I can't really remember much about the food served at dinner parties. I should think the main course was fairly classic in the French style, boeuf bourguinonne, boeuf stroganoff, chicken Marengo, that sort of thing. I remember koulibiac, if that's how it's spelt, which was a sort of fish and rice pie encased in pastry, I think. The focus was usually on the main course - I'd have to look up recipes because I still have all her books and could look for the stained pages - the rest was usually fairly quick and easy, often cold and prepared in advance - the first course might have been avocado - avocado vinaigrette was quite avant garde in Oulton Broad in the early sixties. Otherwise, pâté (home made), smoked salmon, a fairly sophisticated soup, oeufs en cocotte, scallops - that sort of thing. Mummy had little interest in sweet courses, but lemon syllabub was a staple (and still is with me, can't go wrong, totally delicious) and I remember her recipe: juice of a lemon and half the grated rind, a sherry glass of sherry, 4 oz sugar, 1/2 pint cream. Although actually I adapt it now because the modern taste is for more alcohol and less sugar. So I put in 3 oz sugar (about 80 grams, darlings), all the rind of the lemon and, as well as the sherry, a slug of brandy. Otherwise, she had no compunction about serving bought ice cream. Cherries jubilee was a tin of black cherries heated in a chafing dish, then kirsch heated, set fire to and added so that they were brought to the table ablaze, then served with vanilla ice cream. When I was in my teens, I liked baking so it was quite likely that I'd make a gâteau for a pudding. I remember a very good lemon one, where several layers of sponge were sandwiched together with a lemon icing. You did some very thin slices of lemon and simmered them until soft and then added sugar and reduced and poured the liquid over the sponge, then topped it with the lemon slices to decorate. I also made chocolate cakes and mousses - oh, my mother did a very good raspberry mousse - and we did poached peaches or pears. Nothing elaborate, ever. For my father's birthday and at Christmas she made a trifle, which never contained fruit or jelly, it was sponge cake with jam and sherry, then custard and cream, decorated with glacé cherries, almonds and angelica. I haven't seen candied angelica for years. The almonds were whole in their skins, you poured boiling water over them, let them cool a bit then slipped off the skins. I remember the party food rather better. She did big cold buffets, lots of salads - green and tomato salads of course, also classic Caesar, Waldorf, coleslaw (always made with vinaigrette, not mayonnaise) and so on, and her elaborate party pieces were a big hand-raised pork pie and a French raised pie. These both were made with hot water pastry and I never learned how to make them myself. Because they were quite complicated she did the whole thing. The meat was cooked first, then the hot water crust was made and constructed. I don't think she used a mould to shape the pork pie, she certainly did the French raised pie. The latter was oval with incurved sides, pointed at both ends, she had to roll and fit the pastry while it was still warm and malleable, then fill it with the various meats and top it with another rolled-out batch of pastry, then pierce holes, cook it and fill it again (this was the case with a pork pie and probably the French raised pie too) with liquor which would set to a jelly. I think she used a calf's foot for that, can't quite remember. They both did look spectacular and taste delicious. I still have her pie mould but I've never used it. For a big party she might cook a whole ham and a salmon. Decorating the salmon was several hours' worth in itself. I remember my engagement party, when she peeled cucumber, sliced it so thin you could see through it, quartered each slice and carefully laid them as if they were scales. It was so pretty. Very simple food, elegantly served. Mayo was home-made of course, it was always the quality of ingredients that mattered, also its presentation. She made salmagundi, which was a big mixed salad containing cold meat and cheese, all arranged in concentric circles on a huge dish. She also decorated the house very beautifully. I have somewhere a photo of Wink standing in front of the buffet table at her 21st birthday party. It was decorated with garlands of flowers. For one party, she made big flowers out of crêpe paper and stuck one on every door. This was a great success and was repeated with different flowers according to the time of the year - I remember anemones and daffodils. She never counted the time it took, whereas I'll drop a job if I run out of time (and always schedule at least one thing that I'd like to do but can be omitted if necessary), she just stayed up all night to complete it. We helped a lot, my sister and me, but we flagged long before she did. Mind you, after the event she might well collapse with a three-day migraine, I don't think a more balanced view is a bad thing. I've just remembered one spectacularly successful party, at a time in the late '60s when food was getting more and more sophisticated and she decided to turn it on its head and made several big steak and kidney puddings instead. Everyone was thrilled at the traditional, delicious food, especially the men. I'm remembering more about parties and celebrations. I'm going to have to come back to this. My mother worked incredibly hard, even when we had a daily help or, for a while, a live-in maid. We had a cooked breakfast, a proper lunch and a cooked dinner. Most of the vegetables were home-grown - brought in by the gardener every day, but a lot of preparation was needed. She didn't make cakes or puddings and usually there was only one course. We did have a dishwasher - for years, ours was the only family I knew of with a dishwasher and she had a very well-equipped kitchen. My father was also an excellent cook, but my mother rather dreaded him taking over. He used a new utensil for everything and never cleared up as he went along. One job he always took over was cooking fish and chips. This wasn't a matter of popping down to the chippy. I never ate from a fish and chip shop until after my father died - in fact, I remember when I first did, it was during a school visit to Wales with the Lower VI and the games teacher, Miss Hewitt, to celebrate the end of the school year. I got on quite well with her because she didn't bother me, knowing my complete lack of team or competitive spirit I was left to my own devices as long as I did something reasonably active. So, fish was bought, potatoes were dug up, peas were picked if it was the season, otherwise Birdseye were permitted (they were grown locally and frozen at the factory in Lowestoft). The fish was filleted and battered, the potatoes peeled and chipped and fried until pale but cooked through. Then the fish was fried and the chips received their second frying. Tartare sauce would have been homemade from scratch and lemon quarters provided, along with Malden sea salt. After the meal, my mother would disappear for an hour to clear up. The other job my father took on was making marmalade. He made lovely marmalade and added extra ingredients at the end, such as glacé cherries or a few whole almonds so that it looked pretty in the jar. He also, if my mother had been away for a day, cooked a celebratory meal for her return, spending hours looking for new recipes and planning carefully. I remember one once, a whole pear, carefully peeled and cored and wrapped in puff pastry which was cut into a strip and wound round the pear, leaving the stalk sticking out. Underneath the pear was a spoonful of raspberry jam. As it baked, the pear juice became a sauce that spilled out when you cut into the pastry. It was delicious. My parents had frequent dinner parties, they were very sociable. Wink and I helped get ready - we were very involved in everything. It always surprises me a bit when someone explains an inability to cook well by saying that their mother was a good cook so they never needed to learn. I learned by watching and helping. We all talked a lot about food too, I learned classic cooking terms early and the proper techniques - though there are a lot I don't use nowadays. For example, one made pâté from scratch then, it was normal. And it was before the days of food processors, so the liver was minced twice to make sure it was smooth. Some of you have suggested that it was an awful lot of work, looking after seven dogs (no one has mentioned eleven, I suppose it's beyond your imagination to understand how to do that!) but it didn't seem to be at the time. That is, one dog is a lot of work and two is a bit extra. Having three isn't anything more at all, and so it goes on. And there was plenty of room so, whilst they enjoyed a walk with one of us, there was no need for them to have several long walks a day when there was a garden big enough for them to run in. What dogs do mean is more housework. And it was a house that seemed to take a lot of cleaning anyway. It was a light, airy house with high ceilings and, as you can see from the photo, big sash windows, which let in a lot of draughts and therefore dust. We had open fires in the winter and that created dust too of course. And the dogs trod in dust and shed hair and if you didn't clean up every day there were dustbunnies drifting across the floor. We had no fitted carpets downstairs (except in the kitchen, as it happens) and the parquet floors had to be polished daily. In dry weather, you might get away with going around with a dry mop first to get rid of the dust and hairs, then go over with an electric polisher, but dogs (and people) coming in with wet feet left pale patches on the floor and you had to start by spreading Mansion House liquid polish with a mop, then polish it off with the electric machine. That would be done a couple of times a week, even in dry weather. Dusting was done most days and was thorough. Every piece of silver (which was all kept out, none in cupboards) and every piece of china had to be dusted, picked up and the furniture it was sitting on dusted. It was all taken off the dresser or cabinet regularly so that the furniture itself was polished. The ceilings and picture rails were dusted with a long-handled brush and the rugs were hoovered daily. The silver was polished every week - sometimes you could get away with just 'rubbing it up' but often you had to get out the Goddard's silver polish, especially if there had been foggy weather. Brass was polished slightly less frequently, but at least once a month. Obviously, kitchen and bathroom cleaning was done every day and bedrooms regularly, probably rather less than downstairs because they were used less so didn't get so dusty. Beds were changed every week and sheets, pillowcases and towels were sent to the laundry. My mother and I used to wonder, in later years, at our complaints at having to unpack the laundry basket every week, check off each item and fill it again, making a list as we went. Once we did the laundry ourselves, we appreciated what a luxury it had been. Johnny called in every week to pick up one basket and deliver the previous week's, ditto the dry cleaning. Everything else, my mother hand-washed. The window cleaner called once a week and I've a feeling that, once in a while, he was also asked to clean the windows inside, but I may be wrong there. Oh, by the way, while Wink was here last week I asked her the purpose of the little room on the left of the stairs in the passageway to the guest bedroom and the upstairs loo. It was the ironing room, apparently, an ironing board was kept set up there permanently. She's right of course, I'd forgotten. As I've said before, the dogs used to be let in and out of the tall narrow side windows in the drawing room and dining room. However, if it was raining they were allowed out but not in. So they'd come to the window, scratch at the glass and you'd stand and point to the back door (which was way round the side of the house and they'd run off. If you were busy for a minute and didn't want to go - maybe a vital moment in a tv programme, then it wouldn't be long before one of the dogs would reappear looking impatient and you'd have to go to let them in straight away and apologise. Of course, it took a few minutes to dry them with towels before they could come through to the rest of the house. The dogs' food was cooked freshly for years, my mother bought cheap cuts of meat and it was boiled up with vegetables, a few days' supply at a time, and we cut it up daily and biscuit was added along with some of the gravy. They especially liked liver, but it was too rich for them to have more than a little in with the rest. They also had household scraps. We'd never not had dogs, so we didn't notice the extra work, and when there were a lot of them it took a bit more time, but not much. We walked them at least once a day, but only because they enjoyed it, they got plenty of exercise in the garden. Susie and I used to go off together often, sneaking out unobserved by the other dogs. I remember it as being me who did a lot of the dog walking, certainly by the time I was ten or so. We didn't use poop scoops but they weren't often necessary anyway - the dogs preferred to 'go' unobserved in the garden. Certainly, no male dog would deign to squat in front of any of us. Wink and I spent some time talking about the rest of the dogs that lived in the doghouse. There were two more generations of pups and, whilst I could remember all the dogs of course, I couldn't always place the siblings together. As I've said, all was fine while Simon was alive, but things fell apart a bit after his death. The Sage says he remembers Simon but not Huckleberry, so that means that darling Huck must have died first. I remember that day well because I looked after him for some hours while waiting for the vet, it still brings tears to my eyes, more than forty years later. These last were born once my stepfather was on the scene, after I was married but before they were. And my mother didn't prove equal to being the pack leader and Muldoon wasn't bothered, and the young boys had a fight. It must have been awful for her, such a thing had never happened before. Valentine got bitten on the neck and later developed epilepsy. It was such a shame, he was a lovely dog. Rather like Huck in appearance, though his hair wasn't as long, he had a heart-shaped white mark on his head which prompted his name. After this, my mother kept the dogs apart as far as possible for a while - that is, in two groups - until things settled down. Weeza remembers visiting as a small child and being quite nervous in amongst the swirling mass of dogs at her shoulder height. I used to ask my mother to shut some of them in the kitchen, but she pooh-poohed that, they were all friendly and harmless and it would be good for Weeza to get used to it. It wasn't, needless to say. She was quite wary of dogs for years. My stepfather wasn't that keen on dogs himself, but he loved my mother very much and willingly moved in with the lot of them upon their marriage. This was in early February (I'm not big on anniversaries, I have a feeling it might have been the 9th. Otherwise the 8th or the 4th), 1976, and I do know the year because Al was born that April, in that house. Having hated a hospital birth with Weeza, I asked my GP if he was willing to deliver my next baby and he was very pleased to. Home births were well out of fashion at that time and it was an unusual request. Jess and Susie lived to be very old, 17 and 16 respectively, but both Valentine and Clovis died fairly young, Clovis in an accident. It wasn't really fair to expect Wilf (my stepfather) to live long-term in my father's house so it was put on the market. Two building plots had already been sold, a widow had to pay death duties on her husband's estate in 1970 (Socialism gone mad? I'm not a Socialist, you tell me) and she had to raise some money. However, by the time the house was sold and a new one bought, there were only five dogs left, Muldoon, Bassington, Isobel, Sam and Simon. But it still seemed too many to take with them, so Wink and I offered to take one each. Thanks so much for all your helpful advice and suggestions yesterday. It's clarified several things for me. Trying before we consider buying is certainly the way forward, and hiring a tool in the first instance makes a lot of sense. In fact, that might be the best thing to do overall, and maybe buying a much lighter strimmer to keep things under control, along with scything, earlier in the year. If we do decide to buy a brushcutter, it will be for the use of a gardener, its weight and power will be too much for me for more than occasional short use. Time to consider downsizing? Well, it's been discussed. But it's out of the question as far as the Sage is concerned. So I'm tackling the situation round its edges by trying to declutter instead. With his proclivity for continuing to collect stuff, any stuff (I discovered a chair he'd bought last week and hidden in Ro's bedroom), this is an uphill battle. I point out that when we're dead the children will get in clearance people and have massive bonfires, so better to deal with it now while he's got control. Anyway, yesterday I started to go through Kenny's shed. I still can't get in the door, but there's space on a couple of shelves. Darlings, advice needed, please. We're pretty well without help in the garden again and it's all running away from us. The Sage is keeping reasonably up with the grass cutting, but I'm going to have to buy a strimmer. And so, since personal recommendations are always the best thing (and the 'don't touch it with a bargepole' ones sometimes the most useful of all), can any of you help? It needs to be pretty heavy-duty, so possibly a brushcutter - certainly not something for lawn edging, which would be the last job I'd do after everything else: ie, never. It'll have to be petrol-driven, because I'll be using it too far from the house for an electric one. I'm short and not that strong, the handle has to be adjustable and it shouldn't be too heavy. I have done some research (blimey, it's boring, which is why I'm asking you) and the lighter-weight ones don't seem, from the reviews, to be especially well made. But I'm looking at a Draper one that seems to be well made, efficient, easy to start, not too expensive - but it weighs over 10 kilos before fuel and I'm not sure what I weigh in kilos but it's somewhere in the 50s, which seems to make it quite a lot, proportionally. I've got to use it, it's too much for the Sage, who has had mini-strokes and needs to take care. There seems to be a sudden price jump from between £100-£200 to £400+ and it would have to be damn good to consider spending the latter. I'd rather not. I want to order it soon. I'm going down to the local shop to see what they have, because ease of carrying and use is fairly vital. But I'd appreciate your input, if you can help. Nefertiti was medium sized, with short hair, mostly black but with tan markings. She had a stocky build without being at all fat - solidly muscular, rather. She was a cheerful, friendly dog, very affectionate and she loved to play. Her favourite game was a mock fight, when she'd dive in head-first for a tussle. No growling, absolutely no aggression, just a friendly test of strength. We called her Joe Frazier because he had the same head-first, get stuck in attitude in his fights. Her sister Cleopatra was much the same size but she had quite a different physique. She had long, black, silky hair and a soft and gentle body, she wasn't muscular at all. She loved to sit on your lap. Well, not your lap, my lap or anyone's lap. Seven dogs does sound a lot and there certainly were people who thought there were too many, when they all ran out barking to check out a caller. But they were actually quite an orderly bunch, kept well under the control of Simon, who was a strong but completely benevolent pack leader. They were never in the least aggressive, any of them, apart from that one incident when Muldoon turned briefly on Kipper, there was no fighting and they were very friendly to people and welcomed visitors. Muldoon had one foible, however, he was intrigued by people wearing shorts. Shorts were worn quite, erm, short at that time, and he couldn't resist, but had to give a little nip. Not to hurt, he didn't break the skin or even leave a mark - it seemed to be the equivalent of pinching the bottom and he didn't mind whether it was a man or a woman. This time was probably the last when I was quite carefree. Our family circumstances had changed somewhat, financially in particular, because of the very heavy taxation on investment income in the mid and late 1960s. And prices had started to rise so, whilst our gross income was much the same, we had much less after tax and it didn't go so far. It didn't matter to me, I have never been too interested in possessions or clothes, but it was difficult for my mother to accept. I didn't join in the last ever family holiday, sadly. It was my sister's 21st birthday and, asked what she'd like as a present, she asked for a holiday in Scotland. This was in the April just before I took my O Levels, when I was 15. I said that I couldn't go, I had too much work to do. I'd stay at home and look after the dogs. It was arranged that a neighbour would come in each night and sleep in the house with me, not that I would have minded being alone, and otherwise I looked after things. My mother stocked the fridge, but after they left it occurred to them that I'd been left no money at all. And so I received the only letter I ever had from my father. I can quote it in full, although I haven't seen it for years (I have it somewhere, not sure where). Dear Zoë, it said, Herewith cheque for £5 which you can ask Jean Barnitt to cash for you. And he'd signed it with his full name including his middle initial! I didn't need money however, so I never did bother to ask Jean Barnitt (who was another neighbour, not the one staying with me) to cash it. Everything went fine, I enjoyed myself. I prepared the dogs' food, which was freshly cooked every couple of days, I cooked robust meals for myself, including plenty of vegetables and I walked the dogs. I did spend much of the days revising, it was good to have no one there to distract me. I don't remember being invited out to friends' houses or having anyone round, in fact I'm quite sure I wasn't/didn't, which seems a bit odd as I had several good friends who lived nearby. Maybe they were away too, or maybe they were revising - Valerie would also have been taking O levels and her brother Johnny and friends John and Jim were a couple of years older, taking A levels. We didn't go to the same schools, Johnny and Valerie went to neighbouring schools in or near Edinburgh, John went to Oundle and Jim to Cheltenham College. Their fathers worked for Shell and they'd spent much of the time working abroad, usually in the Middle East, so the offspring all went to boarding school. Wink and I didn't because our mother wanted hers to be the strongest influence on our lives. Unfortunately, it involved us going to a rubbish school, where I was happy enough but Wink certainly wasn't. There was a dog whose name I couldn't remember, and I've been puzzling over it for several days. And then, thanks to Rog (a bit obliquely) I had the clue. Songs. Musing this evening, the words "lost and gone forever" came into my mind, because I sometimes have felt warm nostalgia from the posts of the last few weeks but sometimes rather bleak regret ... anyway, that led me to Clementine, and I thought that was the dog's name for a minute, and then I knew it wasn't, and then I remembered the reason for his name, which was a heart-shaped white patch on his head. Okay, Nefertiti next, Valentine later. But the memories are all there, just a bit deeply buried sometimes. Susie had eight puppies and for some reason I can't quite remember we kept three of them, Muldoon, Cleopatra and Nefertiti. They were born on the 24th January, though I'm not quite sure of the year it was probably 1968. I can't find any photos of Muldoon, but he was a handsome blond dog with some white spots on his face (hence his name - there's a song called Spotty Muldoon) and he adored my mother. Susie was an excellent mother and kept her puppies under tight control. Even when they were grown up, she was still the matriarch. If Muldoon (it was always Muldoon) misbehaved, she'd take his head in her mouth, not to hurt but to assert her authority and he meekly gave in. However, he was quite possessive and, sadly, this led to ructions. As I've said before, Kipper adored my mother too and spent a lot of his time at our house, but Muldoon became jealous and one day he rounded on Kipper and growled at him. Kipper was terribly upset and never came to the house again. If my mother called at his house he was as affectionate as ever, but the close family bond was broken. Muldoon was very handsome and very charming. "If only they made men like Muldoon..." we used to muse. At this time we had seven dogs, Simon, Huckleberry, Jessica Gee, Susie, Muldoon, Cleo and Neffi. When I took them for walks every day there were too many to manage on a lead so I took four and let the other three loose. They were quite sensible and didn't run into the road (though not chasing cats wasn't guaranteed). It was always me that walked the dogs, I'm not sure why that was. I suppose everyone else was too busy, and Wink lived in London by that time anyway. In the summer of 1969, I was taking my O Levels. On the 18th of January 1970, everything changed abruptly and forever. We'd all been very ill with the 'flu epidemic that spread through the country. Christmas was miserable. I can't think why we bothered, but we cooked the usual turkey and ham, although no one could face food. It stayed in the fridge until it went off, and a couple of weeks later, embarrassed to put it in the dustbin, I staggered down the garden and dumped the food in the Broad. We recovered in the end, though still didn't feel very well. On the 17th, my father went to a Town Council committee meeting, though he wasn't really well enough to go out. In the early hours of the next morning he had a heart attack and later, in hospital, he died. My mother stopped eating. She lost over 2 stone in weight in the next few weeks and later she said that it was only Muldoon's anxious love that kept her from deliberately starving herself to death. She was very strong-willed, quite capable of it. I have never quite come to terms with the fact that she chose to live for a dog and not for her fatherless teenage daughter, but there we go, that's what she said. She never did put the weight on again, she chose to be thin - rather too thin, to tell the truth, and it did no good for her health in the long run. I remember Muldoon as one of the most loving and faithful dogs I've ever known. Things changed in the next few years, but Muldoon was the constant, always at our side when things were hard. To lighten this gloomy post, an anecdote of Muldoon's puppyhood. I was sitting in my parents' bedroom reading, leaning on one of the posts of their four-poster bed, sitting on the floor (I've already said that we mostly sat on the floor because chairs were primarily for dogs) when suddenly Muldoon got up and ran for the door. As he scuttled over my legs I felt a warm, wet sensation. Sadly, he'd been caught short. Well brought up by Susie, he knew that puddles in the house were not allowed, but he couldn't wait, and there was a zig-zag of pee sprinkled across the carpet as he made a bolt for the door. Across the carpet and my legs, of course. Just briefly - gosh, isn't it hot? 29º in the shade, 34º in not quite full sun an hour ago, so that's just hot for England, it's barely a mild day for some of you, of course. I have to say, I love it. I'm far too hot, but what a pleasure. If you're struggling, please be patient. It won't last and we can all go back to complaining about rain in the summer again. I've recently discovered that my transformation is complete - that is, to someone who thinks better at a computer than with a pen in hand. It's been the case when writing letters for some years - isn't it still a pleasure to receive a hand-written chatty letter in the post? But I find them hard to write now. Emailing is more natural to me. When writing a document that really matters, I still print it out for the final proof-read because errors that I overlooked on the screen jump out at me on paper, but I can't write it on paper any more. Anyway, the completion - I sometimes, when I get around to it, do The Times crossword. I don't often finish it, sometimes I just get a couple of clues, sometimes most of the way. It's a red letter day when I fill in the final clue. But for the last couple of days I've been doing it on the iPad. And I've always needed to hold a pen and the newspaper to be able to think my way into a cryptic crossword. No more. I whizzed through three-quarters of yesterday's ... that's it, I couldn't finish it, I still haven't even though I wrote down the answers I'd got in the paper to see if that helped. But, although I did jot down letters to think my way through an anagram, I actually found it easier on the screen than I normally do in the paper. I still prefer a real book to those I read in the Kindle app, but I have to admit that I've bought at least three times as many downloaded books this year as paper ones. And I like to hold a proper newspaper. Well, and read it. Not hold it with the furled umbrella and the bowler hat. Oh, and I turned of WV again, because it's so damn annoying. I can't read it when I try to comment on blogs and have, in the past couple of days, had to have up to three goes before getting it right. But I've already had a couple of spam comments - which don't find their way into the comment column, they're filtered out. So why do the wretched spammers bother? As Tim says, everything was delivered, or at any rate, it could be. If my mother decided I needed a new dress, for example, we might go to the shop or she might phone and ask for a selection of dresses in my size to be sent 'on approval.' They would duly turn up, I'd try them on and one would be chosen and the rest sent back. Come to that, if my mother wanted to buy something for herself, she wouldn't try it on in the shop unless she really did need to buy there and then. She'd pick out things she liked the look of, take them away on approval and try them on at home. Very civilised. Oh, moving on a decade or two, do you remember the ghastly time when shops did away with individual cubicles and had communal changing rooms? What on earth was that about? It only lasted a few years, I should think clothes sales plummeted in that time. Even if you were reasonably confident about your body and few enough women are, stripping off and trying on clothes among strangers is just awful. You never picked up things in shops and took them to a till, an assistant came to help you. What was sold back in the 50s and 60s that isn't available now? I can think of soda syphons - you sent them back to the shop to be refilled, or maybe there was a deposit on them - which came to the same thing, you always needed soda water on hand, even if only to add to whisky. Lemonade came in glass bottles with a deposit on them - they were still around in the late 1970s, I remember buying fizzy 'nade for my older children. Smiths Crisps (did it have an apostrophe? I can't remember) with its little twist of salt that you unwrapped and sprinkled into the packet of crisps, then held the top of the bag and shook to distribute. Years later they tried reintroducing it, but it was in little sealed squares and it wasn't the same at all. Sweetshops, with their glass jars of sweets - they're still about, though there aren't too many of them, but the jars are plastic now. Why did some sweets vanish while others are still made? Spangles, for example. Other sweets that we ate then are still about, though you do need a proper sweetshop to find them, such as sherbet fountains (though the tube of liquorice is hygienically wrapped nowadays which does rather spoil things), aniseed balls with the little seed at their centre (aniseed balls rarely have that nowadays, which is a bit of a cheat). Walnut whips can be bought now, but they cheesepared many years ago by removing the walnut half from the inside - it used to be embedded in the base of the chocolate - and only leaving the one on top. And surely they're smaller than they used to be, or is it just that I'm bigger. Do Wagon Wheels still exist? They got smaller, for sure. If you would like to add your own recollections, let me have the email you use for your Blogger account (I don't know if it would work for other blogs, though we could give it a go) and I'll add you to the list of people who can post on this blog (I think this is awfully brave of me)- you can add to this one or write a post of your own. If there is any enthusiasm for the idea, Tim suggests we could start a blog on the subject - it might be fun to share memories. I expect it would flare brightly as we remember things and then we'd all snap back to the present, but that doesn't matter. Two more posts about childhood memories, then back to the dogs. Many of us have supermarket deliveries now (I don't, but I might if my local Co-op did it, I try to spend my housekeeping money in the town where I live) but, whilst that's quite a recent thing, doorstep deliveries were the norm before the days of supermarkets. Milk was delivered daily, of course. Initially as I've said, the milkman came round with his horse and cart (and if a pile of dung was left outside your gate this was a bonus and you nipped out with bucket and shovel before your neighbour did), but electric milk floats gradually superseded the single horse-powered vehicle. We still have milk delivered twice a week, in returnable bottles, though I suspect the latter isn't the norm now. Incidentally, Adnams brewery in Southwold kept its horse-drawn drays for many years for local deliveries, it's within the last ten years I should think (yes, I could google it) that the heavy horses were finally pensioned off. Most people buy milk from the supermarket, I rarely do. We continue to buy from the milkman and the rest of our milk comes straight from the farm and Jonny's Girls. Jonny is planning to extend into cheese production soon, as you'll see if you follow the link and scroll down. The baker's van called round twice a week, I think. Good fresh loaves, though the cakes and biscuits were all packaged. In those days my mother never baked cakes and we rarely bought them either, but if we did they would have been not very interesting ones from there. The fishmonger phoned from Beccles once a week and took our order - he'd reel (geddit?) off what was fresh in that day and deliver the order later. I don't remember whether there was a fishmonger in Oulton Broad, surely there was? It seems odd now, to live in a fishing port and buy from several miles away, because the fish was certainly taken from Lowestoft to Beccles and brought back again to us, but it must have been a particularly good fishmonger. There were several smokehouses in Lowestoft for delicious kippers and bloaters. Kippers were always bought in pairs in those days, but I couldn't eat a pair of kippers now, they're very filling. Of course, the fishing industry has been almost wiped out now. In the 1970s there was a lot of concern about the Russian factory fishing fleet that trawled up pretty well everything, it was said then that they overfished the North Sea and so they did. Now, we still have doorstep deliveries of fish - Paul comes on a Monday with his refrigerated van and we buy from him - but the fish is nearly all landed in Grimsby I believe. Meat was bought from Mr Marjoram in Oulton Broad. The shop is still there, I don't know if it's still family-owned but I expect so. Again, whilst we could of course go in and shop, my mother normally phoned through her order and it was delivered. Now, we're well served for butchers, with three excellent ones in the town. I don't buy meat from supermarkets, it's expensive and/or not very good. That is, I might buy some chicken portions or something once in a while (only British meat - apart from things such as salami and Parma ham and so on, I never buy imported meat) but rarely and not as my first choice. We bought our groceries from Waller's in Oulton Broad. You would go in and ask for each item individually from the assistant behind the counter. Mr Waller or Mr Fenn were most likely to serve us. Alternatively, we could drop in a written order to be made up, or telephone and in either event the groceries would be delivered later. In the late '60s the first supermarket opened in Oulton Broad. Privately owned and run by Mr Faulkner, it was very good and it was so much quicker to go round and pick up your own groceries that many people started to shop there. Later, Mr Faulkner sold that business and started up a health food shop next door. In addition to local shopping, my parents had an account with Fortnum and Mason for items they couldn't buy in Lowestoft - ridiculously enough, Gold Blend instant coffee was first obtained from London - and we particularly enjoyed choosing the Christmas order. I remember the sweets best, Griottes en Cognac - Morello cherries in brandy encased in dark chocolate - and Amandines, which can't be their full name and I've never been able to track them down again. They were a torpedo-shaped butterscotch rolled in flaked almonds and wrapped in silver paper and were delicious. If anyone can identify them and tell me where to buy them, I'd be immensely grateful. I've tried in Fortnum's a few times over the years and they couldn't help me. Some 20 years ago, my mother said to me, wistfully, that our order from Fortnum and Mason cost about £25, what did I think would be the equivalent now? I suggested, with inflation, at least £500. We both sighed. It would probably be double that now. I occasionally buy something there still for old time's sake. We rarely needed to buy vegetables as we grew everything, but we bought fruit and imported stuff. I don't have clear memories of a greengrocer though, so it probably came from Waller's. My parents were always on the look-out for something unusual and avocados, aubergines, okra, Chinese gooseberries (now called Kiwi fruit) and so on were sent for from London in the first instance. Later in the '60s you could buy most of them locally of course. The wine merchant was in Lowestoft. Peter Dominic's - though the name changed a few times over the years that was it for most of the time. I suppose they delivered too, I don't remember, though I do remember calling in with one of my parents regularly. Wine was on the table at every meal - every dinner anyway, maybe not lunch. It was usual to have a glass of sherry or gin and tonic or whatever - my father had a fondness for Pernod - and wine with the meal. If there were guests, port or liqueurs were passed round afterwards. It's my lingering belief that a decanter of port should always be passed to the left, because of the superstition that if the port is passed the wrong way, a sailor dies at sea. Fortunately, it doesn't count if the port is in the bottle. Now there are two wine merchants in Bungay, I also sometimes buy online in which case it's delivered or I go to the supermarket. My parents had accounts at all the shops of course, and so didn't need to carry much money. It was all done on trust, "put it on the bill" and, although it turned up fully itemised it was paid without question and promptly. My father despised the practice of keeping traders waiting for their money - a young friend who worked for Peter Dominic said that it was surprising how many well-respected people didn't pay their drinks bill for many months, but our attitude was that if you can't afford it, you don't buy it. And (with due respect and sympathy for those who can't make their money stretch to basics, I'm not meaning them) that has always been my rather simplistic attitude to my household accounts. The Sage and I were going to a funeral today, so contacted Mike and Ann to see if they would be in if we called in afterwards as they live in the same town. It transpired that they were going there too and invited us to park at their house and go back with them afterwards for tea. The funeral was a warm and affectionate send-off to a dear man, whom I didn't know well (the Sage knew him and his wife much better) but I liked very much. He used to come to our auction viewings and, whilst his wife looked at the china, he drew sketches of people, to their amusement and pleasure. We will miss him. And so, I have seen Mike's shed, complete with forge and anvil. And his cellar! I'm really jealous of his cellar. Thank you so much, Mike and Ann, for your hospitality and I hope we can return it soon. The Sage and I had intended to go out for dinner last night, but it didn't quite happen so we went tonight instead. This is a very rare occurrence. We went to a local pub - not the one in the village, they don't do evening meals, but in the next village across the marshes (not that we went that way, we drove instead). Only problem is, I'm always the designated driver nowadays. Hmm. I'm having my glass of wine now instead. Until the late 1950s, our milk was delivered by Mr Jones by horse and cart. One day, he proudly told my mother that he was buying an electric milk float for his deliveries. "What about Tommy?" she asked keenly. Tommy, 24 years old (oh darlings, he was the horse), was going to the knacker's yard. Well, you can imagine. Mummy gave an impassioned speech about the years of service, the awfulness of the end, the duty to a faithful servant. And indeed, by the end of it we had acquired an elderly horse. So, some outbuildings were converted to a stable and annex for feedbins and so on. And a saddle and bridle were bought, but it turned out that Tommy wasn't prepared to be ridden. When introduced to me, he tried to eat my hair, which was sort of hay-coloured, admittedly. So he was just a pet. When he'd eaten all the grass in the paddock, he was walked a mile to friends' paddock - oh, they were the parents of Peter, with whom I went to Corfu recently (with his wife, don't get excited, lovely man but no). One day, he (Tommy, not Peter, do keep up) trod on Mummy's foot. Her toe never really quite recovered and nor did her nearly new Italian shoe. A friend, known to me as Uncle Cyril (I'll add the only other anecdote I remember about Uncle Cyril in a minute), once fed Tommy a very large carrot, one of those rejected by Mr Weavers as not to be put in the horticultural show, but pretty damn impressive anyway. It was too much for him and gave him colic. He had to be walked and walked, because if he'd been allowed to lie down he'd have rolled, and a twisted gut would have been the end of him. He lived to be 30, old Tommy. I don't remember that much about him, but I do remember that he enjoyed his pint of Guinness on a Sunday morning. It had been his treat on his day off, and we kept it up. I've got some Guinness in the fridge. Next time I pour a glass, I'll raise it to good old Tommy. Uncle Cyril and his wife whose name I can't recall at present lived in Gorleston. One day, he took me and Wink and quite possibly a few friends to the cinema to see an Elvis Presley film. This was in the '60s and it was faintly embarrassing as the Beatles had already rather superseded Elvis in popularity - but balding, middle-aged Uncle Cyril sang along. Poor man, he was certainly a lot younger than I am now and I granny-dance, let's face it - but we cringed. I hope he didn't realise. Children can be so cruel. The kitchen garden was quite big enough to grow enough vegetables and fruit for the house all year round. Gooseberry and currant bushes down near the bottom, then several beds with various veg in, then the topmost bed had the raspberry canes and strawberries. In later years, when my father had died and we didn't have a gardener any more, my mother and I did the vegetable gardening. She sold off the end with the hothouses in and a house was built there. The well with its pumphouse was also in the kitchen garden. This came on with a timer twice a day. If ever, for any reason, something went awry there we got an airlock and this was a real pain. The pump had to be primed and the air had to be released from the pipes in the house. This meant turning on the tap in the cloakroom and waiting for the most awful belches and bursts of air and water. There was a terrace around the house - the drive and the house itself were at a higher level than the lawn. It was on the terrace steps that the photo of us and the dogs were taken. Below the terrace there were big flowerbeds, the width of the house. When we first moved in, the lawn was broken up by flowerbeds too - two big squares, each with a circular bed at its centre surrounded by four small ones, like squares with a bite taken out. These were filled with bedding plants. They were removed pretty soon, the arrangement was quite old-fashioned, it was a vast amount of work and it meant that the usable area of lawn was very small. Beyond the lawn were rosebeds containing 250 pink Queen Elizabeth roses - they were lovely but unscented, sadly. Then there were the herbaceous borders. They attracted loads of butterflies and bees every year. Next was a patch of rough grass where wild flowers grew, and lots of bulbs came up in the spring, and then another area of lawn before we got to the river bank, or rather the quay heading. We had riparian ownership for some feet into the Broad - 15 feet? I don't know - and there were tall wooden pilings that boats could be moored to. On the right hand side as you looked from the house there was a slipway and a side channel for mooring boats. I spent a lot of my childhood simply messing about in boats. We didn't sail - it didn't interest my father who loved speedboats and raced before the War, and my mother was afraid of the water. But I splashed around in the water and we rowed in the dinghy and I enjoyed nothing better than a clear, calm evening out on the water in one of the side channels where it was quiet and I could look for wildlife. I also messed around in the water in the ponds in the rock garden. This was no ordinary rockery, it was huge. During the recession of the 1920s, my grandfather was instrumental in having Kensington Gardens in Lowestoft constructed - a public garden laid out quite elaborately with lots of stone boulders surrounding small flower beds, all interconnected with concrete paths. We have the original gold key from the opening ceremony, which he performed. It was very labour intensive to build and provided jobs for many men. Being a man to put his money where his mouth was, he had a similar sort of thing done at his own house. The focus was on ponds, eight of them. The topmost one had a waterfall built up of Westmorland stone. The water was pumped up, fell into the first pond, which overflowed into concrete channels and then went on to each pond in turn, ending up at a large round formal pond surrounded by a brick wall, which sprayed the water into a fountain. The small beds tended to be infested with marestail, which is a bugger to eliminate. They dried out in summer too, but I remember lots of flowers in spring. The scent of lupins takes me back there. Also the flowering currant because there was a large bush by the waterfall. My favourite pond was the one with newts in and I spent hours there. An unusual feature of the garden was a big mound of earth covered in trees and shrubs called, erm, The Mound. I don't know if it was there all along, it was certainly man-made, or if it was built during the War to house the air-raid shelter. We were forbidden to enter this because it was supposed to be unsafe, and I was ever obedient so, whilst I peered in, I didn't set foot in. We could scramble over the Mound though. I remember tamarisk and rather a lot of brambles - there were various shrubs but I can't quite place them now. The Mound was on the left of the house as you look at the photo, you can't quite see it. On the right hand side, also out of picture, were cordon apple trees and, beyond that, two quince trees and a huge bay tree. Well, I don't suppose bay is a tree, a shrub rather, but it was certainly very large. The quinces were marvellous, I still love the scent of quince. I played fairly aimlessly in the garden, mostly on my own apart from the dogs. I ran about a lot, mostly being a horse. When other people were there we played tennis, using the cordon apples as a net - which I suppose did them little good - and I suppose organised hide and seek, chasing games and so on. But I was often alone and I don't remember minding that. I played with Wink sometimes, but she is older than I am and we liked different things as a consequence. There was a little summer house down by the river, I almost forgot. My parents didn't use it, but we did. And my father had another one built up between the Mound and the next-door hedge, near the waterfall. It was known as Jane's Gazebo. I wonder at the point of memory, when it matters to no one and it's all gone now anyway. Ah well. It's imprinted, I couldn't lose it if I tried. A break from nostalgia, darlings. I've been wallowing too deeply and I need to wade out and dry off a bit. Although I realised I was too much in the habit of telling you my daily round and I resist habit, so a different style of content is a good thing. What I want to tell you about is my shed. Yes, my very own shed! The Sage, Al and Mike put it up today while I was in Norwich. It's quite small, about 6' by 8', but it's my very own and when there's a lock on the door I'm jolly well holding on to the key. It's mine! The Sage may borrow tools from it, but only if he brings them back. If not, it'll be the last time, I'm quite determined. Actually, I stood in there (it's quite empty at present) and shut the door and felt ... what does this say about me? ... I felt safe and happy. Not that I'm unsafe nor even unhappy, or vice versa, when out of the shed, but it must have something to do with the confined space. I was in Norwich to buy presents for Zerlina's and Augustus's birthdays this weekend. And their parents' wedding anniversary - 7 years - is the day in between. Wink is coming up for the triple celebration. Well, it'll be a single party on Sunday. But anyway, she's coming and I'm so looking forward to seeing her. And maybe she'll put me right on a few details about the Doghouse. I'm putting off the next dog blog, I have to admit, because it leads to a dark period and, as you know, I keep it light. I also met Ro for lunch, which was lovely. I've not seen him for several weeks and had birthday presents to give him. Sadly, his birthday was three weeks ago. Indeed, bad mother. *Hah, Jonny B, hah. I have claimed the !!! as my own. A stroll round the garden, while you're all being so kind as to indulge my nostalgia. To start with, Broad View Road is a cul de sac. As you came down the road, our boundary started just past Romany Staithe, at the corner of the kitchen garden where there was a large holm oak at the start of a shrubbery. This oak blew down in a storm one night which was a great pity as it was a beautiful tree. After the kitchen garden there was one of the gates to the drive, which ran all along the house and garage and then curved back towards the other gate. Another shrubbery was between the drive and the road and there was five foot tall chain-link fencing. Just past the drive and before the hedge between us and the next-door house, there was the stable and the adjoining shed where feed etc was kept. I suppose these were just outbuildings originally until we had Tommy, the milkman's horse - oh good, there's another story to tell you. As you look at the picture at the top of the page, you can see the conservatory at the side of the house on the left. Next to that is a passageway which went past a small courtyard - this wasn't used for anything much, and the outside toilet (I don't know if our gardener used it but none of us ever did) was in there. Then came the back porch and back door and then you came out on to the drive, with the gate in front of you and the garage on the left. Past the garage and there was a large, lean-to greenhouse, the lower half made of brick. Beyond that was another building, I think it was a sort of Nissen hut, and possibly used for storing logs but it was removed eventually, and then the hedge. When you went down the path by the greenhouse you came to another brick-built greenhouse, this one being freestanding, so you took a left and a right turn (in the corner was the fig tree) and came past the small lean-to greenhouse behind the garage - in the picture it's almost hidden behind the tall plant in the left of the herbaceous border. We had a lot of greenhouses. In the garden there was one more greenhouse - the kitchen garden was very much our gardener's domain so my father created another plot for himself so he could grow things and not get in the way. His greenhouse was aluminium and he liked to grow more unusual plants - one year he grew loofahs, for instance. I grow loofahs every few year, they're quite easy but take ages to dry out and mustn't be damaged at that time or else they rot. He also grew things like aubergines, okra, chilli peppers and so on, which you couldn't buy locally. The conservatory had a flower bed on one side and a plumbago and a nectarine were planted in it. We were the only people I knew who ate nectarines as a consequence - peaches were easily obtained in the summer but, quite oddly, you couldn't buy nectarines in our neck of the woods in the early 1960s. There was staging on the other side with lots of pot plants on it. In the kitchen garden were the hothouses, two long greenhouses with a boiler house adjoining. At the end was a tank for water, so that it would be room temperature and not chill the plants. The kitchen garden had a number of long beds with paths between - I expect each of them was about 10 feet wide, probably 40 feet or more long. There were 6 - 8 of these beds. There was a big greenhouse, the width of the bed on one of them and it was on a sort of track - the idea was that it could be moved each year onto fresh ground. Tomatoes were grown here and I think chrysanthemums were too. Pots and so on were stored under the wooden staging in the brick greenhouses and plants in their pots were put on top. Cucumbers were grown into a pile of manure. I don't suppose that was put direct on the staging but I don't remember*. My parents and our gardener, Mr Weavers, were keen competitors at the local horticultural shows. They specialised in vegetables of course, and also in delphiniums and begonias. Mummy and Daddy went to Members' Day at the Chelsea Flower Show every May - in those days you needed to be elected, not just *anyone* could join and you definitely dressed up for it. The last time she and I went, she was quite upset at the sight of a man with a large stomach, dressed in shorts and sandals and nothing else. Anyway, they headed straight for the Blackmore and Langdon display to see and order the latest delphiniums and begonias. I remember one huge bloom that was grown in our greenhouse - my mother fetched a 10" dinner plate and held it in front of the flower. It showed all round. The trick to get a delphinium stalk to open on the right day all along its length is to spend the night with two buckets of water, one hot and one cold. Dip the stalk in one, then the other and it brings on the topmost flowers before the lower ones droop. Showing vegetables and flowers is not only a matter of having perfect specimens, they all must match too. You might have to dig up a whole row of potatoes to find six that are the right size, a nice shape and are all virtually identical. When the Norfolk or Suffolk or even the local show were coming up, the best produce was kept for that and we got the also-rans into the kitchen. My sister and I were allowed to help ourselves to as many undersized tomatoes as we wanted though, and they always taste best straight from the vine. Once, Mr Weavers came and spoke to my mother - "is Zoë helping herself to raspberries?" Mummy assured him that I was not. She didn't even ask me first, she knew I wouldn't do that without permission. A watch was kept and it turned out to be Huckleberry, jumping over the fence into the kitchen garden and delicately helping himself, taking each raspberry between his lips and pulling it off the cane. We used several sorts of manure, pig, cow, sheep and horse. I can't now remember which was best for which purpose, but Mr Weavers knew his muck. I do know about the sheep droppings - sheep being kept outdoors, their droppings had to be collected individually. They were put into water and the resultant dark brown liquid was diluted and used as liquid feed. *Yes I do, the manure was put on a square of wire netting - I'm still not sure about the staging though. Wendz asked about the car in the picture. We only ever had one white car, so either it's that or it belonged to a visitor. I've been looking for pictures of our white car and can't find one taken from just that angle, but I think it's possible that the car is my father's Daimler Dart. If it is, this dates the photo to the very early 1960s. My parents saw the car at the 1959 Motor Show when it was introduced and ordered it. My father's previous sports car was the Austin Healey Sprite, the frogeye model. We travelled all over Europe in that when I was five. I was a dainty child but my mother said I got heavier with a bonier bottom by the day - it was a two-seater and there were four of us, they put a little seat in the middle behind the seats for my sister, who was just eleven that spring and must have been quite uncomfortable, and I sat on my mother's lap. That was the holiday we were about to leave for when we first got Simon. I don't remember all that much about it, we visited several countries but I only really remember Austria. We stayed at the Sport Hotel which might have been in Innsbruck and I do remember liking Innsbruck very much. I also remember being overcome by the sight of all the snow with the sun shining on it and crying - little wuss - but afterwards eating oranges and enjoying the scenery. The next year, my parents went back to the hotel and the staff were very disappointed that I wasn't there. "Where's Alice?" they asked - I was often called Alice in my younger days, even when grown up, right up until the time I had my hair cut short, in my thirties. I suspect that this car wasn't fast enough for my father and that was the reason it was replaced by the Daimler Dart. My mother always had a second-hand Daimler and my father also had a small runabout for general getting about town. All our cars were always British, there was no question about that. My mother had learned to drive in a big car - I think it was a Lanchester - and there was no clutch but, as she told me, a "fluid flywheel and pre-selected gears" which was, I suppose, the precursor to the automatic gearbox and she never mastered the clutch. If she'd had to, she would have but she liked the feel of a big, coach-built car and didn't mind how old it was. I have to say, I see her point - I used to like a nippy little car that was easy to park when I used to go to Norwich a lot, but I do like the weight and high seat of my present Landrover and I'm rather enjoying having an automatic again, though I don't mind either way. My parents' first car was an elderly Landrover which was missing its back door. When they drove to London for a banquet at the Mansion House, they wedged a suitcase across the gap to stop everything from falling out of the back, and cheerily handed the keys over for it to be parked, not being a bit dismayed by having such a scruffy old car among the smart ones. I was born later the same year and my mother insisted on selling it because she was afraid of my carrycot falling out. Later they had a Morris Oxford - there would have been no question of an Austin Cambridge. The town was never mentioned in our house - as an Oxford graduate, he'd have referred contemptuously to 'the other place." I never even visited Cambridge - which is lovely, of course - until after he died. I've been rambling on and I meant to tell you about the Daimler Dart. It was a marvellous car, very fast with a superb engine. However, as so often happens, there was a problem with the detail of manufacture. They had a reputation in the early days of a door flying open at speed. Worse was a fault that came to light when my parents were on that holiday they took without us. We had been left with our Dutch au pair's parents in the Hague and they left for another tour of Europe. They visited Nice, Chamonix, Capri, Innsbruck, Vienna - can't think of other places at the moment, but it was a lovely tour. They had been driving across the Alps, up and down winding mountain roads with hairpin bends, then reached their overnight destination. When they set off again, my father drove down the road, braked for a junction and the brakes failed completely. He twisted the wheel to the right, turned the corner at some speed and, changing down gear, slowed the car with the wheel against the kerb and finally stopped it with the handbrake. When it was taken to the garage it transpired that the brake cable was too long and rubbed every time he put his foot on the brake - the mountain trip had finally caused it to wear through and all the brake fluid was lost. And if it had happened an hour's drive earlier, they would have still been on the mountain and would certainly have left the road and been killed. When they arrived home, there was a letter from the garage calling the car in for the fault to be corrected. But no matter, an accident that didn't happen isn't one to dwell on. Some years ago, we visited the Haynes Motor Museum near Yeovil and it was a brilliant nostalgia trip. They had all the cars that my parents and the Sage's parents and their friends had ever owned, large and small. What was particularly good was that it wasn't just the big cars, like the Sage's godfather's Bentley, but the little Morrises, Austins, Rovers and so on that most people had. Few people had a foreign car in those days. Well, I have been back before as I said, but this time I looked at the road with a more critical eye, and my goodness, they have crammed in the houses. Of course, having Broad frontage and a proper quay heading, right opposite the park, it's valuable real estate - but almost all the houses in the road now have another crammed in their garden, but as the building line is way back from the Broad, they must all have really long, narrow gardens. 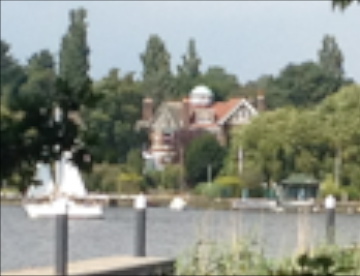 Anyway, this is the view of the house from the park opposite. And with the house itself picked out. You can see how the house was divided in two because the original slate roof has been replaced with tiles on the right-hand side. That was done last year - the Sage happened to call on a friend in the road and saw the builders and he brought a slate back for me, very thoughtfully. I rather loved that roof but I can quite see why the present owners had to choose a different material. They were Welsh slates, they'd cost a fortune now, even supposing they were available. We drove round to Broad View Road. On the way, I took a snap of Caldecott Road, where Simon and Huck used to chase the cars. It's a long road - I said half a mile and I wasn't exaggerating. Here is the house, the two halves, from the road side. Not very attractive at all, the front was the river side and that is the nicer view of it. The wall and railings weren't there in our day, there was a chain-link fence and a shrubbery and then a drive the length of the house. A garage has been added to each house and the original garage has been replaced by another house. Four houses have been built in the kitchen garden and to the left of our house and the gardener's cottage has been massively enlarged and two more houses built in the garden and paddock there. That's ten houses where there used to be two. The original gardener's cottage, with the dormer windows added, is the pebbledashed part on the right. I've been out today with Dilly, who has been reading my recent posts and was interested to see the house I've been talking about. Having known her for nine years, she says that I've never told her anything about it - and it's true, the past is over and done with and I don't normally revisit it much. So we went to the park for lunch and looked at the house opposite (and I did take some pictures, but it's mostly obscured by trees) and we drove round to the road and saw it from the other side and then we went to the church and visited my father's grave and my half-uncle's. And then we went to the place where our new saleroom will be at our next auction in September. Hay was with us so, while at the park we took him to the playground and he had fun on the swing and slide and so on. I've been out this evening and have just got back, so tomorrow I'll download the photos and see if there's anything worth showing you. Must phone Wink now, she left me a voicemail message a little while ago. I'll track back a bit so you know why we lived there. My grandparents married in 1909 when Helen was 16 and Selwyn (I know, poor chap) was 26 (I think) and my father was born the next year. Selwyn (was he ever called that? Shorely not. He was later known as The Major) had visited Lowestoft - his parents lived in Sussex and London - and loved the area, as well as Helen. They lived in a rented house in Cotmer Road when they were first married, while they were having their own house built. The land they chose was in Oulton Broad and was the first house to be built in that road. The building materials were brought up the river by barge. There were 4 acres of land altogether, the house set well back from the river, with a substantial kitchen garden alongside the flower gardens and lawn and a gardener's cottage on the other side of the road with a lot more ground including a paddock. They moved in in 1912. When my parents married in 1947, my mother was taken to be introduced to her new in-laws (yes, that way round). She and the Major got on swimmingly from the start (we'll gloss over Helen who didn't get on with anyone) and it was her dearest wish to move up from Weymouth to look after him - his health was none too good by that time. Sadly, they couldn't sell their hotel for quite some years, the Major died in 1952 and it was 1958 by the time we finally moved in. When the house was built it was normal to have staff. So there was a butler's pantry complete with butler, a housemaid's pantry with a housekeeper and housemaid, a chauffeur, a head gardener and two other gardeners and I don't know what else besides. We never lived in that sort of style of course, when I was a small child we still had a live-in gardener and another part-time gardener and my mother had a daily help, though we did have a live-in Spanish maid for a while. Later we just had a gardener, later still an odd-job man. The house had a lot of rooms, though they weren't as big as the rooms in this house where I live now. Coming in through the front door there was a lobby which we called the air-lock, to the left was the cloakroom and separate lavatory. Straight ahead was the door to the hall, which was large. To the left of the hall was the gun room. Off the hall (clockwise from the gun room) was the drawing room, the passage used as a junk room, the study, the dining room, the door through to the kitchen quarters, the stairs which had two half-landings - there were five stairs, turn right and there were seven stairs, turn right and there were six stairs and the landing was above the hall. Between the stairs and the door to the air-lock was the room under the stairs where we kept drinks, which was known as the beer cupboard. Off the dining room was the conservatory as I said yesterday. Through the kitchen door into a little lobby and straight ahead was the butler's pantry. This was lined with shelves on which we kept china and glasses. There was a sink and a dishwasher. To the left was the kitchen. In about 1962 my parents had it done up with all the latest mod cons, built in split-level oven with 8 gas rings on the hob in an alcove with a huge extractor unit, brick-built peninsular work surface with lots of cupboards. The sink had a waste disposal unit and the Kenwood liquidiser housing was built in - you removed a cover and set it in to the worktop. The room had quarry tiles in front of the hob but was otherwise carpeted in pink. There was a big white dresser where all sorts of things were kept and a bit oak Welsh dresser on the other wall. The white dresser was built in and included the hatchway through to the dining room. Through towards the back door, there was the pantry on the left as you went into the scullery, with the stairs down to the cellar off that. The back stairs were next, then the back door which had a porch, then the larder. The cellar was large and housed the boiler and had a separate small room for coal with a chute down from the drive. We kept the fridge in the pantry and there was a sink in there too. The scullery was no such thing when we lived there, it was a kitchen while the big kitchen was being done up, then it was a little sitting room. Upstairs, to the left there was a passage. First there was the housemaid's pantry, then the bathroom which was large and cold, then the upstairs loo. Going past the passage you got to my parents' bedroom and, as I said yesterday, the bathroom and dressing room were en suite. There was a door from the landing to the dressing room but not to the bathroom. Next you came to the spare bedroom, above the dining room. Then there was another passage, off which was the night nursery (many years later, Al was born in this room) and steps down (because the scullery ceiling was lower than that of other rooms) to a half-landing off which were the day nursery and the back stairs. Go back along that passage and the door to the linen cupboard was on your left (it was a small room, the size of the butler's pantry below) before the bit of the landing leading to the stairs to the next floor. It was here that Bobby the leopard lived, so I went past him every time I went to and from my bedroom. The upstairs ceilings were lower so there were eight steps, a half-landing and another eight. Oddly, the window to the half-landing started half way down the wall and the floor didn't reach the edge of the wall as the window continued to the upper half of the half-landing beneath. Does that description make sense? When I was a child I wasn't fond of that gap. I always ran up that bit of the stairs because I imagined a hand reaching to grab my ankle. At the top of the stairs there was a room to the left down two stairs (this room was the one where I later had a double bed shared with three dogs), the big bedroom I shared with my sister next, then a little long narrow room with much of the width under a sloping ceiling under the eaves. Then there was the attic with its big water tanks. Oh - before the attic door was the ladder staircase to the hatchway leading to the tower room, that copper-covered dome at the top of the house. Apparently, you could see the sea from there, at least in theory. The house's name, Seaview, was my grandfather's joke - the sea is a couple of miles away. Yes, I have been back there once since my mother left. Friends of friends bought the drawing room half (it was divided in two) and invited us for Sunday lunch and kindly showed us round. It was much altered of course, but the big sash windows had their original curved brass fittings and, as I went up to the top floor, my hand slipped under the banister for the flat bit where a piece of wood was missing. My host noticed my hand remembering. The great pity was that the builder who bought the house had the beautiful parquet floor removed from the ground floor and it was carpeted. Parquet flooring had been relaid, but it was not nearly so nice. I'll come back to dogs, but now I realise how clear the whole place is in my memory I want to write it all down. I have never reminisced so vividly before, this is quite strange to me. But if you have been, thanks for listening. There's not much point in describing the whole house to you, not without pictures. I wish I could take you there, there are so many pictures in my mind's eye, I remember every bit of it. If you look at the photo above, the two-storeyed building on the left was actually the garage, which was huge, big enough for lots of cars, with a loft above. There were steps up, a workbench up there and a pulley on the exterior wall for hauling things up, though it was never used in my time. In front of that is a building with a pitched roof which was used for storage and in front again was a greenhouse, one of many in the garden - six, I think, or was it seven? Two of them were hothouses, one was a modern aluminium jobbie. Then there was the conservatory, as you see, which led off the dining room. You can see what I meant about the big windows. It was the smaller ones at the sides that we used to open to let the dogs in and out - on the right as you look at the dining room and the left as you look at the drawing room, which is the room on the right-hand side of the house. In between was the study, one wall lined with the bookshelves that are now on my own study walls, filled with the same books, mostly, that I have not been able to dispose of as yet. The yellow door was never used and the passageway leading through it to the hall was used as a junk room. The room above the drawing room was my parents' bedroom, with en suite bathroom and dressing room above the study. There was another bathroom but only guests used that, we all used our parents' bathroom. You see the window sticking out on the first floor on the right? It's not an open window, there was a triangular window seat and two windows at 60º angles. This was ideal for the dogs to keep an eye on things and it was normal for one of them to be there on guard duty when we were out and at night. My mother used to say that sometimes, awake at night, she could hear the watch change. My parents had a four poster bed and we all - well, that is, the dogs and I - got on to it by taking a running jump. I also used to swing on the end posts. My mother would try to stop me, telling me how old the bed was but Z-logic thought that was quite silly. Obviously, if it had lasted all these years being swung on it must be quite strong enough to carry on doing so. Underneath the bed was the Club. I'm not sure if the girls ever went in there, but it was mainly a gentlemen's club and Simon and Huck hung out there. I joined them sometimes, of course, and was made welcome. When we were children, the room above was our bedroom, mine and Wink's. There were three bedrooms, a landing and a big attic on that floor. Much of the attic, quite half of it, was occupied by four big water tanks. We were not on mains water, there was a deep artesian well in the kitchen garden and water was pumped up twice a day into the tanks. I've a feeling they each held 250 gallons - er, can anyone work that out? How much room does 250 gallons take up? Times 4, that is. It was lovely water, completely pure without chlorination and the well never ran dry and the pipes never froze. In the incredibly long, cold winter of 1963 the mains supply failed and people had to fetch water from a standpipe in the village. Or they could come to us, we had plenty. There was a dog bed in the house. It was kept in the gun room. I've no idea how keen my grandfather was on shooting, all I ever heard about is his Purdey shotgun, inherited by my father who never used it, nor did my mother or the Sage who now owns it. It would have to be adapted if the Sage did use it (Granddad was right-handed and left-eyed) but, although a crack shot, he prefers rifle shooting at targets. He doesn't kill for sport. My father was a rotten shot anyway and wasn't allowed to be a soldier in the war. He was sent to join the medical corps. Anyway, the gun room was lined with cupboards and shelves, mostly filled with books, and at the end was a desk with the telephone on and in front of that was the dog bed. So when you used the phone you stood in the dog bed. And because of the way my mother always picked up the receiver and turned it when she put it down again, the lead became kinked tighter and tighter until it could hardly be put down, so once in a while someone would go and pick it up and hold the lead while the receiver spun round and round to unravel. The dogs slept in the bedrooms of course. As I said, one of them was normally in the window keeping an eye on things, one or two might be in the Club or they might be on the bed. Wink and I didn't have dogs sleep in our room when we were children but later, when she went off to college, I had my own smaller room and then at least one dog slept with me. I moved into a different room, still on the top floor, in my mid-teens and then had a double bed and then three dogs slept on it with me, Jess, Susie and Cleo. Although it was a double bed, I never had a lot of room to myself because the dogs liked to snuggle up and one of them usually stretched out across the bed so that I couldn't stretch out myself and slept with knees bent. I said I couldn't describe it without pictures and so I can't. But you've got over a thousand words-worth all the same. I haven't touched the surface, of course. I wish I had pictures.